Scientists are puzzling over the rise of valley fever cases even as a new study suggests that illnesses including diabetes, lung disease, arthritis and certain cancers may increase a person’s chances of dying from the little-known fungal disease. This story is part of the ReportingonHealth Collaborative's "Just One Breath" investigative series on valley fever in California's Central Valley. More people are dying from valley fever than previously thought, and illnesses including diabetes, lung disease, arthritis and certain cancers may increase a person’s chances of dying from the disease, according to a new study. This past year, researchers have puzzled over the rise of valley fever cases. Diagnosed cases have grown from 1,200 in 1995 to more than 20,000 in 2011, according to the Centers for Disease Control. Now researchers have new evidence to consider: a study to be published in the November issue of the CDC’s Emerging Infectious Diseases journal. There were 3,089 documented deaths nationwide that valley fever — also known as coccidioidomycosis — was an underlying or contributing cause of between 1990 and 2008, an average of about 170 deaths every year, according to the researchers’ study of data pulled from death certificates. That’s nearly twice the number reported by the CDC in the past, which has recorded as few as 73 in 2003 to as high as 100 in 2004. “Coccidioidomycosis remains a major cause of death in the United States,” wrote Jennifer Y. Huang, who authored the study as her master’s thesis at the Keck School of Medicine at the University of Southern California along with researchers from UCLA’s Fielding School of Public Health. Dr. Benjamin Bristow, a public health physician and one of the study’s authors, said the paper shows there are “definitely certain groups that are more likely to die from valley fever” and the numbers shed light on those disparities. “We’re finally beginning to get a sense of how real the problem is,” Bristow said. Valley fever experts said the hard numbers on valley fever-related deaths could finally start to draw attention to the disease. Valley fever is often referred to as an “orphan disease” that isn’t very prevalent. But Dr. John Galgiani, director of the Valley Fever Center for Excellence at the University of Arizona, said the study could put a dent into that way of thinking. “This disease was overwhelming, and it’s anything but an orphan disease” for those who died, Galgiani said. The study cements the prevalence of valley fever and draws attention to the fact that, despite its health impact, the disease has not drawn significant federal or private research funding, said Dr. George Rutherford, professor of epidemiology and preventive medicine at the University of California, San Francisco. “There are few infectious diseases for which we tolerate this kind of mortality,” he said. Rutherford said the data establishes a base line to compare trends in the future. “Just from a data standpoint, having this line in the sand is a good thing,” he said. California and Arizona “attract elderly persons to migrate and settle down, thereby introducing new, unexposed populations” to the fungus, they wrote. The study found that more than one-third of the deaths associated with valley fever were people between ages 65 and 84. Researchers also found that there were certain health conditions more often associated with the disease. The most common was diabetes, with 384 deaths that listed both diabetes and coccidioidomycosis on the death certificate. That was followed by chronic obstructive pulmonary disease, HIV infection and non-Hodgkin lymphoma. “The conditions that were associated with coccidioidomycosis were all inherently associated with immunosuppression: HIV, tuberculosis, diabetes mellitus, autoimmune diseases, organ transplant and cancers of lymphatic cells,” Huang and colleagues wrote. Amin said he suspects the correlation between valley fever and lupus and rheumatoid arthritis found in the study could be caused by the medications patients take for those two conditions that weakened their immune system. Researchers also looked at valley fever-related deaths across different race and ethnic groups. While the majority of deaths were among white people, the study found that people of other ethnicities, particularly Native Americans and Hispanics, had the highest mortality rate. Native Americans were about six times more likely to have valley fever appear on their death record than white people, and Hispanics were about four times more likely to have the disease listed on their death record, the study said. Researchers wrote that the high rates of valley fever-related deaths among Native Americans could be tied to cultural practices and exposure to dust. Health care could play a part as well, they wrote. “Poor access to health care services might delay diagnosis, resulting in more severe disease,” they wrote. But researchers also cautioned that Native Americans’ high rates should be viewed carefully because they accounted for a small number — just 79 — of the total deaths. Still, Bristow said it’s important to find the disparities in the groups the disease affects so those discrepancies can be addressed. “I think we have a duty to really put our efforts toward those that are most impacted by illness,” Bristow said, adding that those people often have less access to other resources such as health care and housing. The study’s researchers concluded that valley fever-related deaths will probably rise. “One can probably expect to see more valley fever in the future because we’re seeing more people with problematic immune systems,” Bristow said. Researchers wrote that doctors should recognize the heightened risk of valley fever-related deaths among the elderly, men, Hispanics, Native Americans and people with compromised immune systems. Rutherford said he hoped the study would bring renewed national attention to the disease and lead to targeted funding for a vaccine and the development of new treatments. D. Rebecca Prevots, chief of the epidemiology unit at the National Institute of Allergy and Infectious Diseases, said the report fills a gap in research on valley fever and mortality. The study stands out, she said, because it is national in scope, covers an 18-year span and highlights the racial and ethnic disparities within the disease. “I think it is an important work that calls attention to the issue of cocci and deaths from cocci,” Prevots said. Bristow said that it is now up to physicians, public health officials and policymakers to look at the burden from the disease and design an appropriate response. 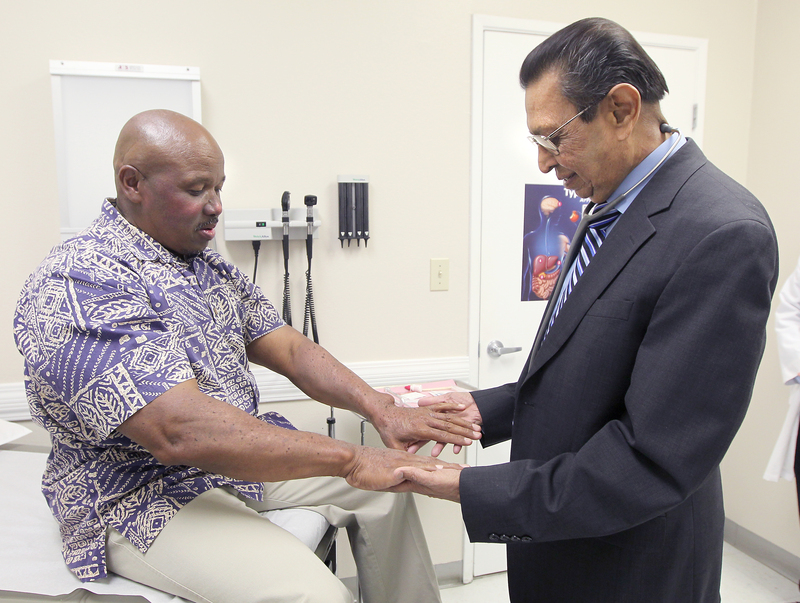 Photo credit: Henry A. Barrios / The Bakersfield Californian - Dr. Navin Amin examines valley fever patient Archie Scott recently at his private practice office. Dr. Amin is the chair of the family practice department at Kern Medical Center and a valley fever expert.